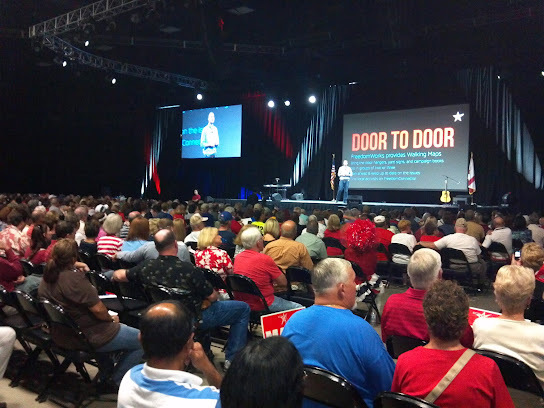 FreedomWorks held another of its successful FreePAC grassroots activism events October 19, this time in Kissimmee, Florida, near Orlando. Freedom-loving activists from around the region came to learn the basics of getting out the vote (GOTV) and to be inspired by great speeches. The highlight for this jaded blogger is getting to meet the heroes of the movement. The group will hold its final FreePAC event in Schaumberg, Illinois near Chicago October 26, featuring Nobel Prize winner Lech Walesa. Activists in Florida learned the best strategies for supporting their local candidates, including the use of yard signs, door-to-door work, phone banking, and how to handle the media -- both new media and legacy mass media, as well. Judge Andrew Napolitano gave a historically-grounded presentation on the Constitution and the correct relationship between the people and the government, while local favorite Andrew Wilkow cautioned attendees not to accept liberal media premises. The best part of a FreePAC to me is not the training or the speeches, but getting to meet my heroes in the liberty movement. My heroes are not the people on stage, but the people who leave the rallies and work to elect freedom-oriented conservatives. We can win the war online and the battle of ideas, but we must also remind our neighbors to vote. Whatever method of contact you choose, you are most effective closest to your own front door. That being the case, some in the broader conservative movement have offered mild criticism for holding the FreePAC events -- which they see as glorified tea party rallies -- in the run-up to the November elections. Those resources could be better used right now in other ways, they suggest. But what better tactic can we use right now than getting people who are interested observers to take the next step and become volunteers? Right now our movement needs motivated volunteers. Another political ad, another robocall, or even another weekend spent on the ground in a battleground state won't have the impact that motivating others to get active will have. Mary Tucker of Key West, FL has actually traveled to several of the FreePAC events. "The most beneficial thing about these events is, first of all, getting me fired up to get involved, " Tucker said. Since attending FreePAC Ohio, she said she had planted "over 200 yard signs." The group around her recognized her as their leader. "We've done a lot of prayer. We have a prayer group. We pray every day. We put a lot of messages out on Facebook" to urge people to pray, as well. Connie Smith of Space Coast Patriots posed after the event with Harmon Kaslow, producer ofAtlas Shrugged Part II, now in theaters. Space Coast Patriots is part of a web of loosely interconnected groups operating in Florida. The people around Smith recognize her, too, as a leader. The local groups took time from knocking on doors and getting out the vote for their favored candidates themselves to help show others how to be active. From the FreePAC Florida stage, Kaslow had urged attendees to view Runaway Slave, a film starring Rev. C. L. Bryant, Glenn Beck, Thomas Sowell, and many others. The movie is available from popular video on demand outlets. Washington, DC- Thousands of grassroots activists from Kentucky and across the country will gather in Louisville this Saturday, April 5, from 1-4pm local time to hear from conservative pundits, entrepreneurs and community leaders at FreePAC Kentucky. The event will be held at the Kentucky International Convention Center, 221 South Fourth Street, Louisville, KY 40202. Washington, DC- FreedomWorks is pleased to announce that Matt Bevin, principled conservative challenger to Mitch McConnell in the Kentucky Senate race, will be speaking at FreePAC Kentucky on Saturday, April 5. Thousands of grassroots activists from Kentucky and across the country will gather in Louisville to hear from conservative pundits, entrepreneurs and community leaders in the Kentucky International Convention Center in Louisville, KY. Featured speakers include Glenn Beck, Matt Kibbe, Deneen Borelli and more. "Oh, no. Another post about the RNC rules. Let me see how fast I can click away from this..."Stop! I get it. Who cares about a political party's internal rules? And when I see "Rule 16(a)(2)" and "delegate’s affirmative duty under state law or state party rule", my eyes glaze over a little, too. Read on, for why you should care. This stuff determines who gets elected and how much freedom you continue to enjoy.